1. 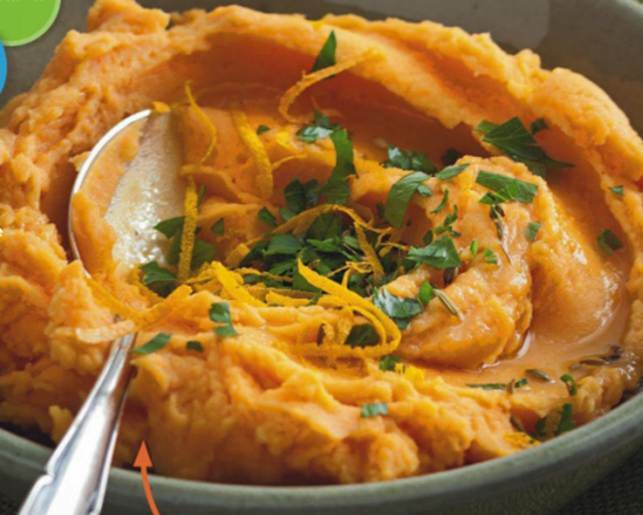 Place sweet potato, potato and garlic in a large saucepan. Cover with cold water. Bring to the boil over high heat. Cook for 12 minutes or until tender. Drain. Return to pan over low heat. Toss for 1 minute or until excess liquid has evaporated. Remove from heat. Using a potato masher, mash mixture. Press through a sieve into a heatproof bowl. Add spread and ½ the milk. Season with salt and pepper. Whisk until combined. Add remaining milk. Whisk until light and fluffy. 2. Meanwhile, using a zester, remove rind from orange (see note). 3. Place fennel seeds in a frying pan over low heat. Cook, stirring occasionally, for 2 to 3 minutes or until fragrant and toasted. Transfer to a bowl. Add orange zest. Stir to combine. Stand for 5 minutes. Add parsley. Stir to combine. 4. Sprinkle fennel and orange mixture over mash. Drizzle with oil. Serve. · Nutrition: (per serve) 1485kJ; 12.4g fat; 3g sat fat; 8.1g protein; 48.1g carbs; 9.1g fibre; 4mg chol; 136mg sodium.